This two-fold free printable Happy Birthday card is fun with balloons and, it's perfect if your kids want to do something special for their friends. Let them have fun because they can make the gifts more personal by adding some glitter and other birthday images. 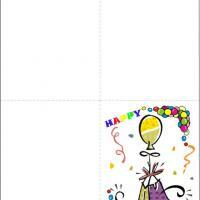 These printable birthday cards are great to use as invitations to parties or as a card sent to a friend. 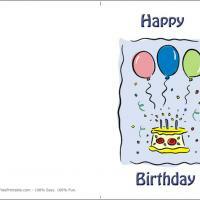 It's a fun card that is sure to please, so print it out today! And make sure you include your best birthday wishes on the inside; there is plenty of room for some creativity there. Who Let the Balloons Out? Our free printable card Balloons and Gifts is only one of the many whimsical cards available to print and customize. The Happy Birthday lettering on the front is playfully releasing a rainbow of colored balloons. 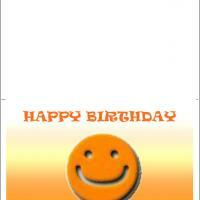 Add some streamers and a gift bag and you have discovered an amusing card to send with a birthday gift. This two-fold card is easy to set up and have your personal greetings printed within and then you print the card right at home. Plus, there is ample room inside to add some more birthday images. Encourage kids to add their own touches too. Balloons are synonymous with birthday celebrations. What better way to announce your best wishes for the birthday guest of honor than with a Balloons and Gift free printable birthday card? 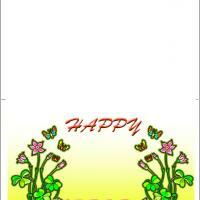 As with all our cards, it features colorful images and some traditional sentiments. The array of non-gender specific colorful balloons and party streamers surrounding a floating gift bag decorated with a fun motif make it a great choice. Plus, you are earnestly invited to try out the easy-to-use custom personalization options for each card chosen. 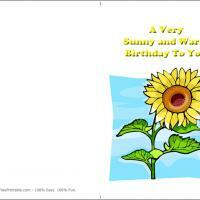 Your heartfelt birthday messages will be as special as the recipient of your thoughtful gift.